Brazil's Chamber of Deputies has again postponed a vote on controversial changes that would ease a key law on forest protection. After a marathon 12-hour debate that saw renewed splits over the proposals, the vote was put off until next week. The Forest Code currently requires that 80% of a landholding in the Amazon remain forest, 20% in other areas. Proponents of change say the law impedes economic development and Brazil must open more land for agriculture. Brazil's Forest Code, enacted in 1934 and subsequently amended in 1965, sets out how much of his land a farmer can deforest. Mr Rebelo argues that the current rules unfairly discriminate against small farmers, denying them the chance to grow more and climb out of poverty. Other changes include reducing the amount of forest that must be preserved along the banks of streams and rivers. It was also proposed to grant an amnesty to landowners with property below a certain size who cut down trees on their land before 2009. 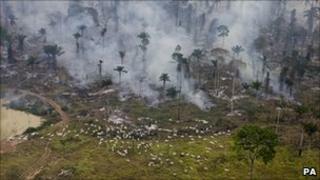 Environmentalists say if passed the changes could accelerate deforestation. Environmental groups have warned that Brazil's economic growth, as well as increasing global demand for agricultural produce, could increase pressure on the Amazon rainforest in the coming years. While enforcement of the Forest Code has been lax in many areas, it has provided a tool for the authorities to go after the worst offenders, environmentalists say. After days of wrangling over the proposal, agreement had been reached in some areas only for divisions to emerge during the debate on Wednesday. If passed by the Chamber of Deputies, the proposed amendments would go to the Senate for a vote.